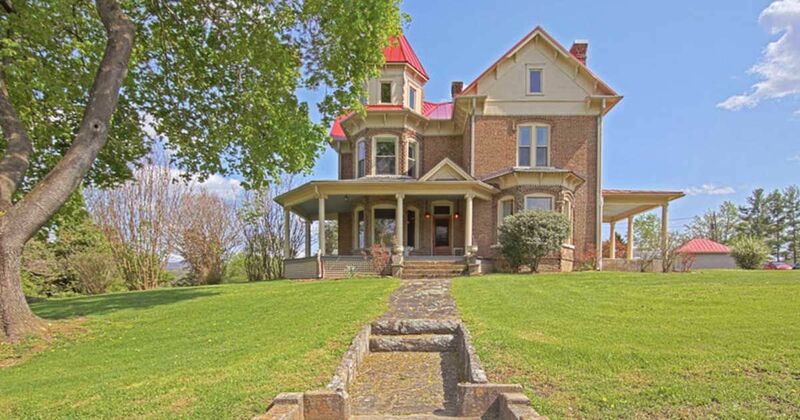 Nestled in the gorgeous foothills of New Castle, VA. is a stunning 3,725 square-foot, restored Queen Anne Victorian, featured in the gallery below. 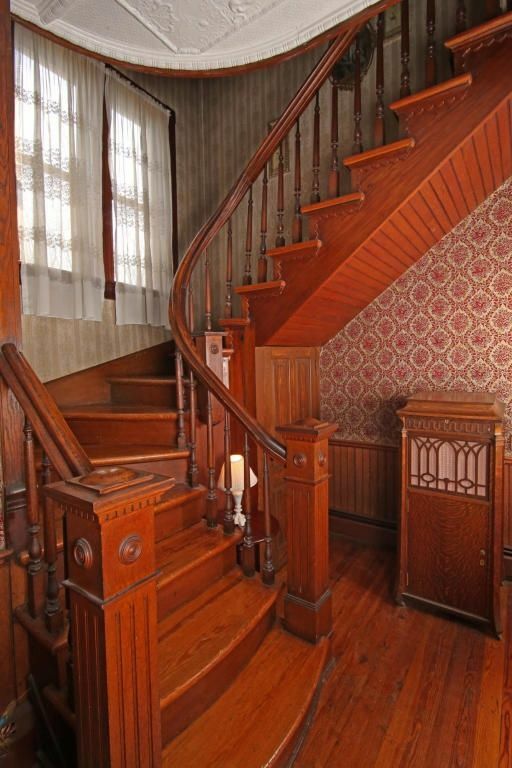 Though the kitchen and baths were remodeled and the roof replaced, there are certain areas of this 1893 home that feel like a true blast from the past. A stone path leads up to the brick-frame home featuring a vibrant red roof that sets the building apart from the vast, green surrounding landscape. Most of the common areas of the house feature warm wood paneling and hardwood floors, and the furniture has been matched carefully. 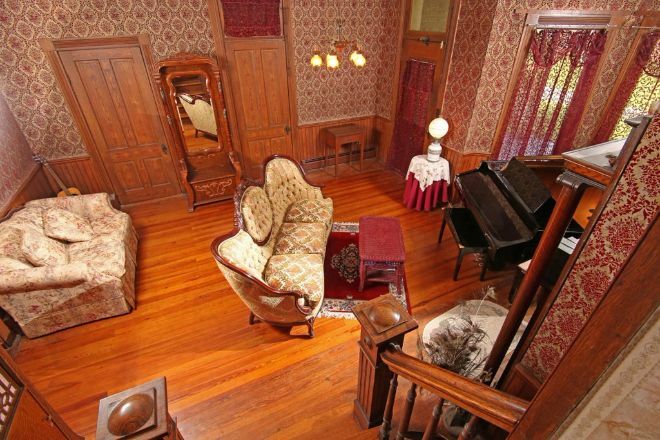 Notice that a charming window seat has been built into the alcove on the far wall! 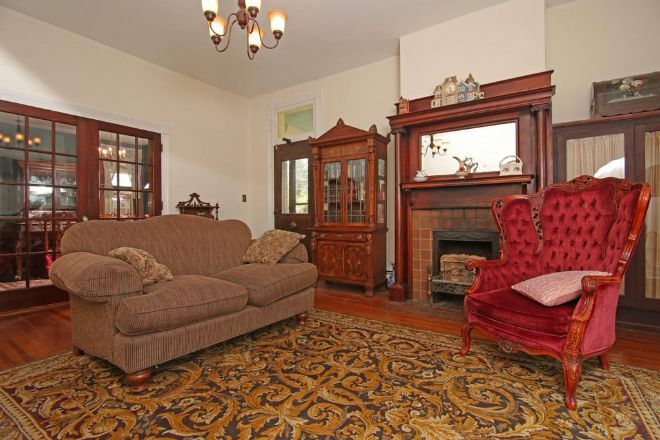 A sitting room features a brick and hardwood mantle around the fireplace - the bricks have been stained with smoke, which speaks to their true age. Three doorways lead in and out of this room, and all three boast beautiful, wooden frames. 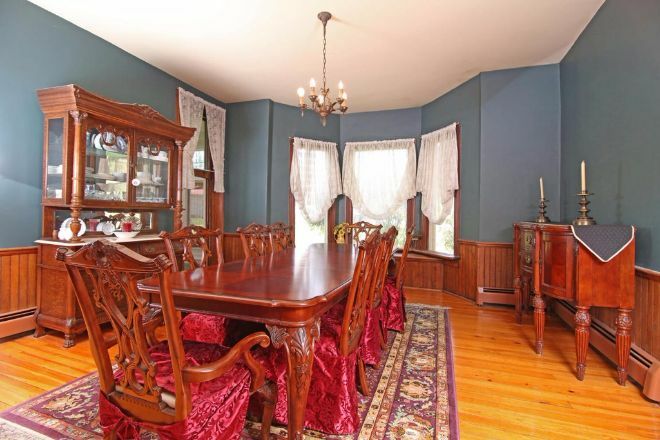 Step into the living room, and the Old-World aesthetic is immediately obvious. 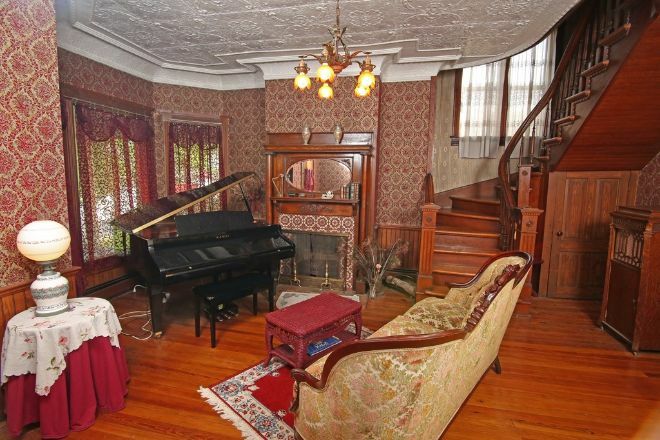 A regal grand piano sets the tone for decor in this space, playing off of the elegance of the built-in features. Elaborate tiling can be found around the fireplace in this room as opposed to the bare brick seen in the previous room. A dramatic, curved staircase beckons you upstairs with its sleek lines. From the vantage point of the stairs, one gets a perfect view of the three, original wooden doors that provide access to this room. The red-toned wallpaper does a wonderful job of bringing out the color in the room's wooden detailing. 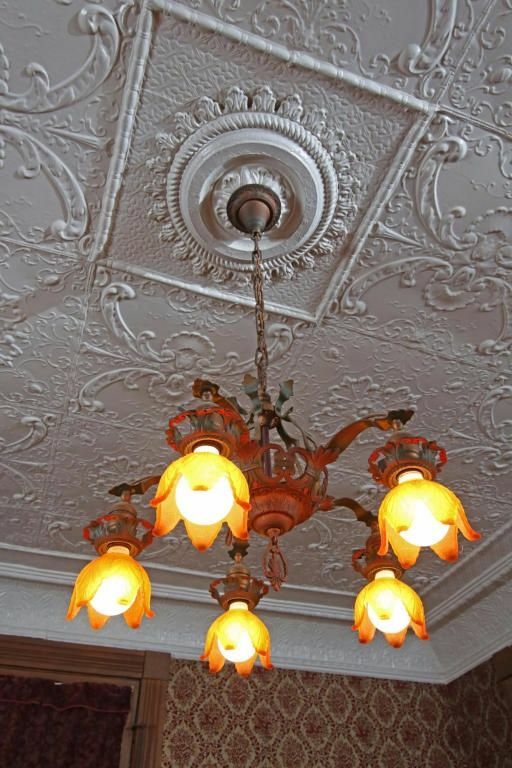 A closer look at the ceiling reveals just how spectacular the detailed molding is, and a bright chandelier serves to call attention to it. 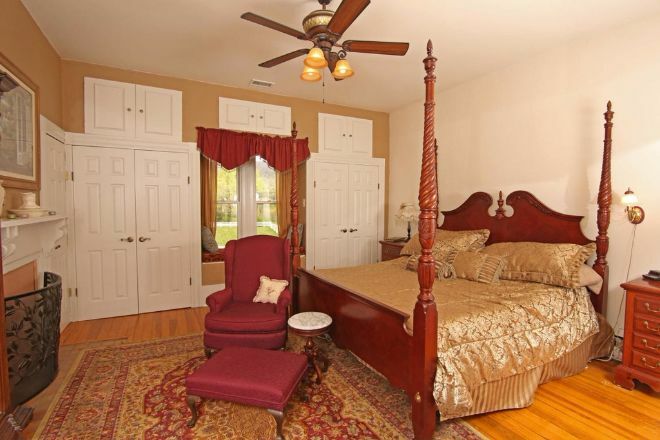 Upstairs in the bedrooms, the master is pictured below, the home feels a bit more modern and its renovations become more obvious. New doors are fitted onto the closet areas against the back wall, and the fireplace has been filled in. The hardwood floors remain, however, and the furniture has been wonderfully matched to keep in line with the strong aesthetic found in the rooms below. 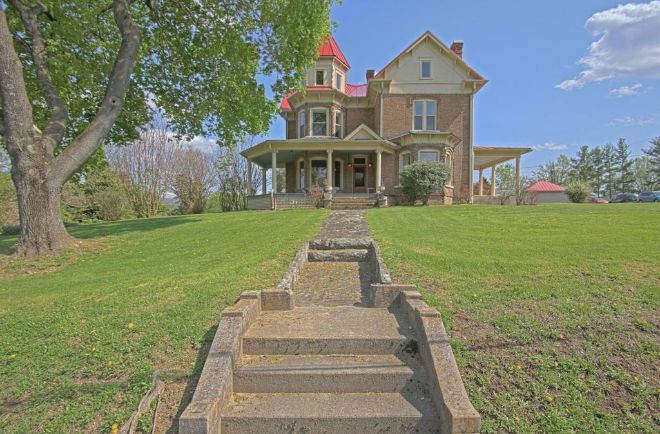 What do you think of this character-filled Queen Anne? Do you prefer the evidently aging aesthetic of the living room or the slightly more updated aesthetic of the master bedroom upstairs? Let us know in the comments below and be sure to share this gallery if you loved it!